Constructed from pressure-treated plywood, the FlexBox is a breathable container, allowing air to flow throughout, never trapping in moisture, and never allowing mold or mildew to damage your belongings. FlexBox storage containers are an environmentally friendly space for your possessions. No rental trucks to drive or fill with gas. Combine Storage and Moving with no extra effort. Delivered where you need them, locally and accross the country. 5' x 8' size accommodates a king size bed, sofa or dining room table. Rent 1 to 100, pay only for what you use! 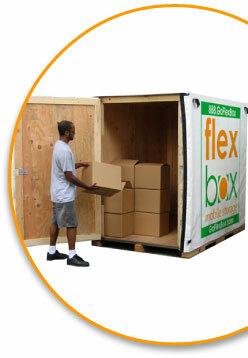 Multiple units let you sort and better secure your belongings. Each FlexBox holds about a room and a half of furniture. Sturdy plywood construction protects your valuables while wicking away mildew causing moisture. Can fit in a parking space, more delivery options including downtown!